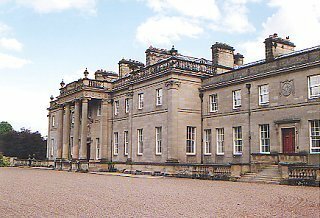 Located 1½ miles (2.5 km) east northeast of Duns and 9 miles (14 km) north of Coldstream in the Scottish Borders, Manderston was originally built in the 1790s. However, the house was recreated between 1890 and 1905 in the 'Adam Revival' style by architect John Kinross for Sir James Millar, known as 'Lucky Jim' because of his success on the race-track. Millar's father had bought the estate in 1860. 'Lucky Jim' married Evelyn Curzon, sister of the Viceroy of India, and her family home, Kedleston in Derbyshire, an 18th Century masterpiece by Robert Adam (1728-92), provided the model for Manderston. Millar spared no expense and Kinross cut no corners; the result is appropriately stunning. The outside is restrained, but the inside is replete with fine ceilings and detailed fittings. Furniture is in the French style. A particular feature is the remarkable silver balustrade on the main staircase, thought to be the only one in the world, which takes weeks to clean. Even 'below stairs' in the kitchens, pantry and such-like, every modern convenience was used, and no detail overlooked. Almost everything can be seen today exactly as it was when the house was completed. Even the dairy is luxuriously panelled in marble, with a vaulted ceiling, making it more like a chapel than its intended purpose. Manderston boasts perhaps the finest stables in the world, again commissioned by Millar in 1895. These include barrel-vaulted ceilings, stalls constructed of the finest teak, embellished with brass and marble, together with tiled troughs, all of a quality more appropriately found in a superior hotel. Outside, there are 23 ha (56 acres) of gardens. Today, the house remains in the family, the property of Lord and Lady Palmer - once the owners of the Huntley & Palmer biscuit empire. They have undertaken a major restoration and have secured the future of the house by making it available for corporate hospitality and as a set for film and television. The building has served as a location for several films, including The House of Mirth (2000) and Man to Man (2005).